Next review DM Auto Leasing - Worst customer service ever!!!! Jun 14, 2016 Your comments posted online have been forwarded to me and I am eager to hear details of your experience. I appreciate you letting us know that there is an issue and I apologize for any inconvenience or miscommunication on our part. Please contact me directly and I will make sure that we address your issues. My office number is 817-461-8888 extension 305. If I am in the office I will pick up. If not, ask for Lisa Woodard my assistant at extension 394 and she can find me. Well One Month after purchasing this Truck let me just list the problems I've had to fix with this truck. 3. Needed new front brakes - 20% left was squeaking very badly when stopping. 4. Had to replace battery - Battery completely died I had to get it jumped to take it in for service. I took it to Champion Ford in Katy and they did an excellent job. All of this one month after getting the truck. Not very happy that I had to leave my truck in the shop for 2 days to fix issues. The amount of time and money that I have wasted in the first month of owning this truck is not worth buying from them again. If you buy a used vehicle from this company be prepared to dish out some extra cash to fix issues that they will not check for. Or check them out yourself and then have them replace or fix the issues before you sign the contract. I was happy with how they dealt with the tires, but after all the new issues that have come up I am not going to mess with buying a car from them again. Go to a dealership to buy used because they actually thoroughly check the car and replace any issues (brakes, batteries, etc.) before putting the car up for sale. Just an update on what the customer service manager told me. "D&M Leasing is a finance facilitating company. We have arranged the financing of the vehicle only. We do not have a service or body shop facility." So unless you are buying a brand new vehicle you are buying a truck that is "As Is." They go by the carfax as documentation that there is nothing wrong with the vehicle. She did offer help finding discount service through one of their vendors. So buy a vehicle from them and then within a month they will help you find discount repair services to fix issues that you have with your vehicle that you bought from them. After posting this I noticed that Joe Graber had left his email in response to a few other unhappy consumers. I emailed him with the same information from below. Within 10 minutes he responded to my email and forwarded this information to the Manager in the Houston Market. He contacted me and he cut me a check for the amount of the tires. James was very professional and understanding and really worked to keep my business. I am extremely happy with the outcome and James as regained my trust in the company. We are planning on buying another car in the next few years and I will be calling DM first. Just bought a used truck from D&M. The truck is in great condition and was told that it was clean and everything was inspected and in showroom condition. Drove it for one day and the low tire pressure sensor came on. I figured that the cold weather caused the tires to deflate slightly. Went to three different tire companies and they all told me the same thing, these tires are very worn. I could continue to drive on them, but they discouraged it. I have a 15 month old son and I am very upset that they would sell me a car that they checked and most likely knew the tires were worn and old, but sold to me anyways. Was told that they sale the trucks as is and sales are final. I guess I got played for a fool. I emailed the GM, but no response. Thankfully the sensor went off or I might have been driving on bad tires for a while and risking my son's safety. I will never buy a vehicle from them again. I am also a teacher and you can bet with over 1,000 teachers and staff in my district I will be spreading the word. Review #323686 is a subjective opinion of djrtbrahma. 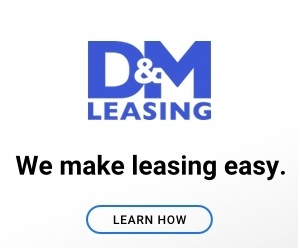 We have had the worst experience ever with D&M Leasing. They are cons. They have lied and they set up their leasing terms to trap the customer. They over charge you and you will end up upside down no matter what. They do not keep their word. I will be spreading the word to my entire school district as well and anyone else who will stop long enough to listen to NEVER do business with these snakes. Can you not visually inspect a tire yourself?